Not many trekkers challenge themselves with this trail. Yet, it is one of the best treks you will ever do in your life. 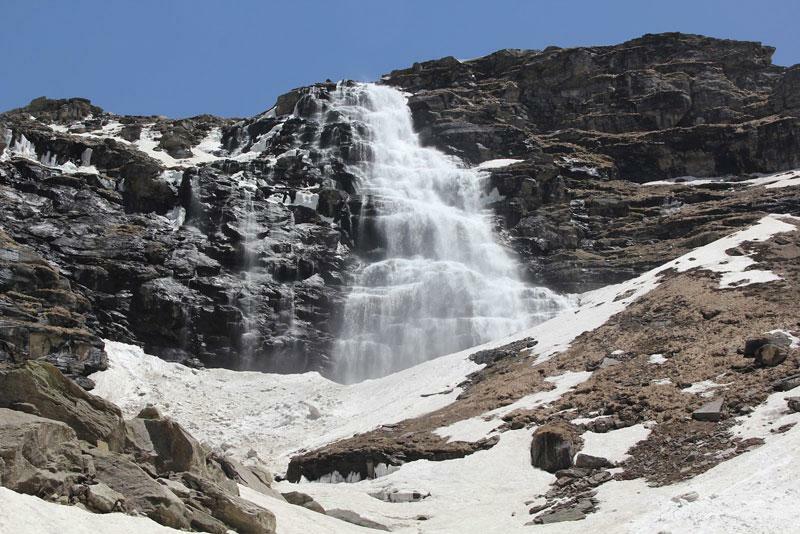 Rupin Pass trek consists of trails dug out of rock faces and wooden bridges, cut through deep dark folds in the mountain, glaciers and icy slopes, and over snow fields. Along the way there are white Rhododendrons and expanse of green meadows. 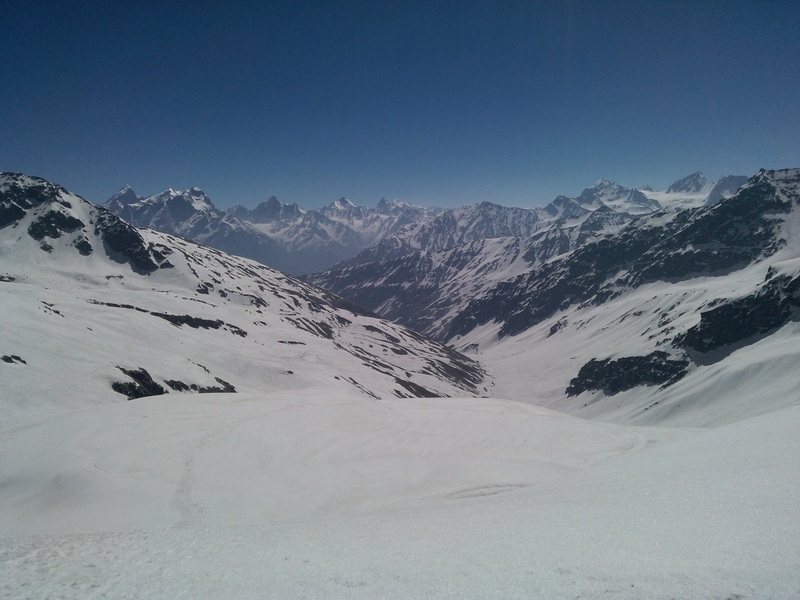 The Pass is perched at 4600m in the surreal Himalayan mountain range of Himachal Pradesh. Based on the intensity of the snow, this path might get challenging at times. Throughout, you will be greeted with stunning scenery such as cascades, verdant meadows, snow-kissed mountains, charming hamlets and big rivers. The delights of the tour include trekking amidst rhododendron woodlands, fields and ascending pictorial meadows. You will also have to brace yourself for climbing up snowy patches. As you make your way through some hamlets, get a fine whiff of their local culture and lives. Also, enjoy fabulous views of Kinner Kailash range along with the hamlets that dot the Sangla Valley. We reach Naitwar from where our trek begins. Halt here for the day and enjoy sight seeing as well as get a chance to chat with locals. We follow a defined mule track along upstream of Rupin River. This region is the remotest of the state and govt. officials dread going here to this tough and remote region as it's situated 24 kilometers from Naitwar and leads us to Dodra Village as we camp here tonight. From Dodra we heads straight for Jakha the nearby village which is the last village in Rupin Valley. From here there is a tough climb of 25 kilometers after crossing the Rupin River. As we reach Saribasa we reach green pastures and cave shelters. We spend the night here after a long and tiring day. Today we will rest, enjoy sight seeing, click pictures, rest and feast as we are preparing for the tough day ahead. Today is a long and tiring day so we wake up early and start over at 5 Am after breakfast and continue ahead for the exciting journey ahead on moraine, snow and boulders but behold as most exciting views await us. However we need to careful and stick along with the guide as the path is a little risky and confusing. We would need ropes in some places. As we reach the top of the pass we will enjoy sweeping views of the mighty Himalayas and witness summits of Kinner Kailash range and those near to Charang La. Unwind for a bit and then begin the descent. After a difficult descent but breath-taking views we reach Sangla Kanda. Its an easy trail over a well defined patch to Sangla which is a beautiful valley and 'big city' after many days in wilderness. We rest here tonight as well as eat out, shop and visit local places. Today we head back to Shimla or may extend our stay for sight seeing in Kinnaur and visit to Kalpa. Click here to know whats included in your package and what to pack?